When I heard the news in England it was 9th December 1980. Apparently this was John's special number. In the 1960's, the ghost of a young boy was seen by a couple of construction workers at The Dakota. 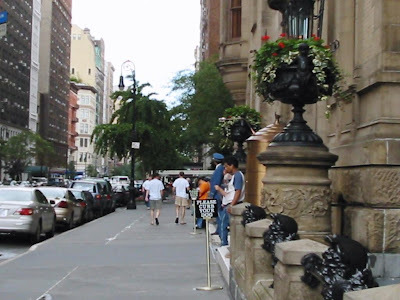 A girl dressed in turn-of-the-century clothing was seen by painters working at the building several years later.John Lennon, who was murdered outside the Dakota in 1980, is also rumoured to haunt the area around the undertakers gate. Roman Polanski filmed the exteriors for Rosemary's Baby at the Dakota; however, the interiors were created on a Hollywood soundstage as the building does not allow filming inside. Personally, I can't look at this building and not think of Rosemary's Baby and be creeped out. I look at this photo below and my mind sees bats where theres leaves and branches. 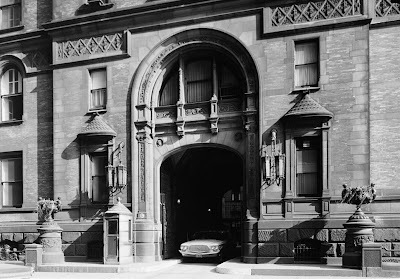 Located on the northwest corner of 72nd Street and CPW, the Dakota took 4 years to build from October 25, 1880 to October 27, 1884. The architectural firm of Henry Janeway Hardenbergh was commissioned to do the design for Edward Clark, head of the Singer Sewing Machine Company whose firm also designed the Plaza Hotel. "The building's high gables and deep roofs with a profusion of dormers, terracotta spandrels and panels, niches, balconies and balustrades give it a North German Renaissance character, an echo of a Hanseatic townhall. Nevertheless, its layout and floor plan betray a strong influence of French architectural trends in housing design that had become known in New York in the 1870's." According to popular legend, the Dakota was so named because at the time it was built, the Upper West Side of Manhattan was sparsely inhabited and considered as remote as the Dakota Territory. However, the earliest recorded appearance of this account is in a 1933 newspaper story. 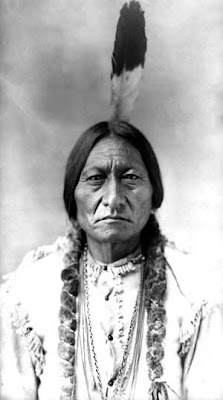 It is more likely that the building was named "The Dakota" because of Edward Clark's fondness for the names of the new western states and territories. High above the 72nd Street entrance, the figure of a Dakota Indian keeps watch. 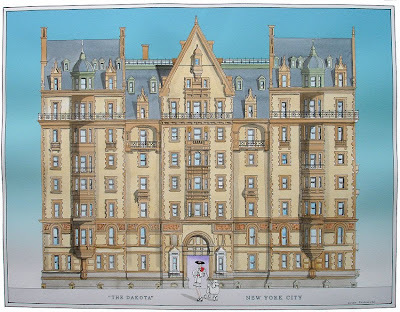 Originally, the Dakota had 65 apartments with four to twenty rooms, no two alike. These apartments are accessed by staircases and elevators placed in the four corners of the courtyard. Separate service stairs and elevators serving the kitchens are located in mid-block.Built to cater for the well-to-do, the Dakota featured many amenities and a modern infrastructure that was exceptional for the time. The building has a large dining hall; meals could also be sent up to the apartments by dumbwaiters. Electricity was generated by an in-house power plant, and the building has central heating.Besides servants' quarters, there was a playroom and a gymnasium under the roof. In later years, these spaces on the tenth floor were—for economic reasons—converted into apartments, too. The lot of the Dakota also comprised a garden and private croquet lawns and a tennis court behind the building between 72nd and 73rd Streets. The stables for the tenant's horses and carriages were located on Columbus Avenue in a building that is now used as a garage.The Dakota was a huge social success from the very start - all apartments were rented before the building even opened, but a long-term drain on the fortune of Edward Clark (who died before it was completed) and his heirs.For the high society of New York, it became fashionable to live in such a building, or to rent at least an apartment as a secondary city residence, and the Dakota's success prompted the construction of many other luxury apartment buildings in New York City.Today, the building is best known as the home of John Lennon starting in 1973, and as the site of his murder on December 8, 1980. 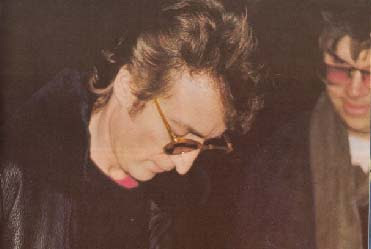 Lennon signs an autograph for Mark David Chapman on December 8, 1980 as he and Yoko leave the Dakota, several hours before the shooting. 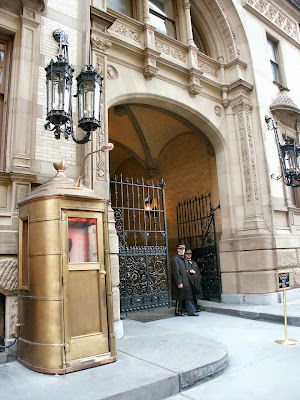 This photograph was taken at the entrance of the Dakota. Notice Chapman is standing to the right, Lennon to the left. 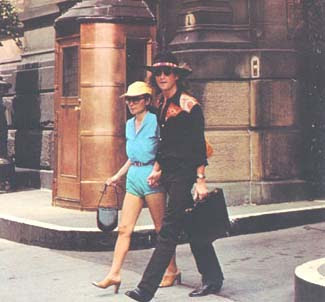 Virtually all accounts indicate that Chapman was at the same location when Lennon returned later. 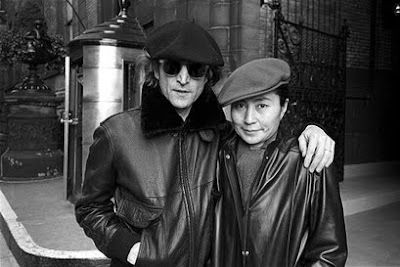 As of today, Yoko still has two apartments in the building. Throughout its history The Dakota housed a veritable who's who of the great and famous particularly in the Arts and Business, including (among others) Andrew Carnegie, Lauren Bacall, Leonard Bernstein, Maury & Connie, F. Ambrose Clark, Charles Henri Ford, Judy Garland, Judy Holliday, Boris Karloff, John Madden and Gilda Radner.Drunken Long Island treehugger Billy Joel and stupid Gene Simmons from KISS both sought residency at the Dakota in the late 1970's, but their requests were denied by the building's co-op board. 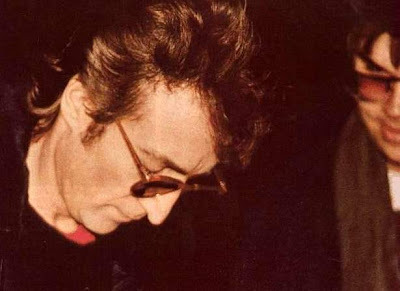 John Lennon was killed by a deranged fan on December 8th, 1980, as he returned to his New York apartment from a recording session. "Mr. Lennon?" As John turns, the guy fires two shots into him. They catch him in the back, spinning him round. Blood already starts spurting from Lennon's wounds as the assassin takes aim again. He fires three more shots. Two bullet smashes into John's shoulder, the other goes astray. There's a crash of shattering glass as the slugs, that had passed through John's body smash into the Dakota's glass frontage. 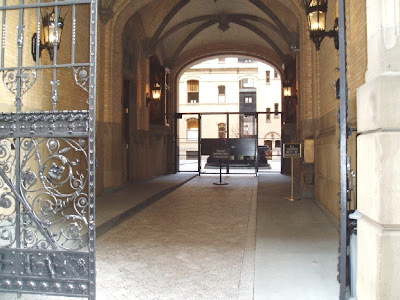 Mortally wounded John staggers up the steps into the Dakota's front lobby, his face horribly conturted. "I'm shot, I'm shot!" he moans as he falls to the ground. "John's been shot!" 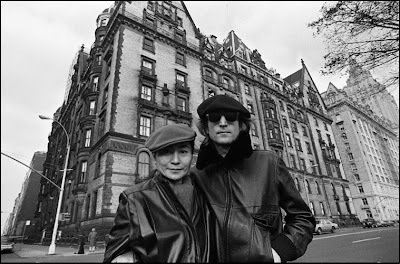 screams Yoko, who follows her husband into the hotel. Jay Hastings the security man reaches under his desk and presses the alarm button, which summones the police from the nearby 20th Precinct Station. After this, he rushes to John's side and removes his shattered glasses. Then he takes off his uniform to cover the victim.He wants to use his tie as a tourniquet, but can not decide where to apply it. John is dying, blood pours from his chest and mouth, his eyes are open but unfocused, he is gurgling and vomiting blood. ...is the terse dispatch that summones New York Police Officer Tony Palma and his partner Herb Frauenberger to the scene of the crime.From the sidewalk Palma sees Hastings and shouts up anxiously: "Is someone shot in there?" He runs up the steps with Frauenberger. In Hasting's office they find a man lying face down with a small woman standing over him crying. Palma turns the body over. He sees that the victim is badly injured and tells his partner: "Grab his legs and let's get him out of here!" As they lift him, Hastings hears as John's bones crack.Bythe time they lay him in the back of a squad car, John loses all control over his limbs. As the car takes off, the driver Officer James Moran yells at John:"Do you know who you are?". Lennon is unable to speak, but nods. The car jumps the red lights on Colombus Avenue. It speeds down 9th Avenue into 58th Street and swings into the entrance of Roosevelt Hospital. The hospital's major trauma team is already alerted.The rapidly fading John is carried to the emergency room. He has virtually no pulse. The two bullets which had hit him on the back had both pierced a lung and passed through his chest. A third bullet had shattered his left shoulder bone, and a fourth had hit the same shoulder and ricocheted inside his chest, where it severed his aorta and windpipe.After an unsuccessful attempt at cardiac massage, a medical team of seven people laboures to save John using every device and technique available. Nothing works. John Lennon has lost 80% of his blood. The official cause of death is shock produced by massive haemorrhaging.